Upper Sandusky had its beginnings as a Wyandot villages. By the early 1800s, the area remained under the control of the Wyandot, and a settlement of free African Americans also was located there. In 1806, seven adults and several children called the village home. Only one white man lived in the community. His last name was Wright, and he was married to one of the African-American women. Many of the African Americans were fugitives from slavery and sought safety by living together. Throughout the 1830s, 1840s, and 1850s, slave hunters passed through the area looking for fugitive slaves. As in Lower Sandusky (modern day Fremont), the residents of Upper Sandusky settled there in direct violation of the Treaty of Greenville. During the War of 1812, the United States Army considered forcibly removing these white and black people from the land to ease tensions between the American settlers and American Indians, but no action was taken. In the 1810s, Methodist minister John Stewart, an African American, established a mission at Upper Sandusky. He and James Finley spent the 1810s and 1820s encouraging the Wyandots to convert to Methodism. They were quite successful. By the mid 1820s, a number of Wyandot had set aside their traditional ways and beliefs. Many were farmers. They built log cabins with brick or stone chimneys and raised sheep, cattle, and hogs. Despite many Wyandot's assimilation to these hallmarks of Anglo-American settler culture, the United States government forced the tribe to leave its land in Ohio for territory west of the Mississippi River in 1843. The Wyandot were the last major group of Indians to be forced to leave Ohio. When Anglo-American settlers originally moved into Ohio in the mid to late 1700s, many lived in fear of the American Indian peoples who called the Ohio Territory home. By the 1840s, only a handful of American Indian nations remained in Ohio, and white settlers viewed them more as a curiosity than as a threat. Nonetheless, the United States forced the American Indians to relinquish their land. Upper Sandusky became the county seat of Wyandot County in 1848. During the nineteenth and twentieth centuries, the community prospered due to its location along various transportation routes. Most residents of Wyandot County were and continue to be farmers. Many people in Upper Sandusky earned their living on either the canal or the railroad, which shipped the farmers' crops to markets primarily in Cleveland, Cincinnati, or Chicago. Other people worked in manufacturing establishments, many of which were affiliated with agriculture. For example, in 1890 Upper Sandusky's manufacturing establishments included two flour mills, two saw mills, a tannery, a brewery, and a machine shop. During the 1930s, many Wyandot County residents suffered due to the Great Depression. World War II dramatically improved the economic situation, and Upper Sandusky experienced a period of economic growth that continued into the 1980s. 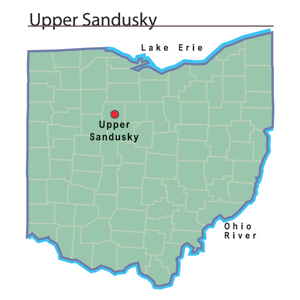 Upper Sandusky had a population of 6,533 in 2000. Unlike most other rural communities in Ohio, the city experienced a small population increase during the 1990s. Several industries operate out of Upper Sandusky. Some of the more important ones include A. O. Smith Electrical Products Company, Blackhawk Automotive Plastics, Dana Corporation/Continental Hose Company, Guardian Industries, Liqui-Box Corporation, National Lime and Stone Company, Midwest Ohio Tool Company, Mold Craft, and Schmidt Machine Company. The Wyandot County Fair, held annually in Upper Sandusky, marked its 152nd anniversary in 2003.